Shackle a creature and deal 1 damage to it. Arrow in the Knee is a common Agility action card. It is part of the Core Set. 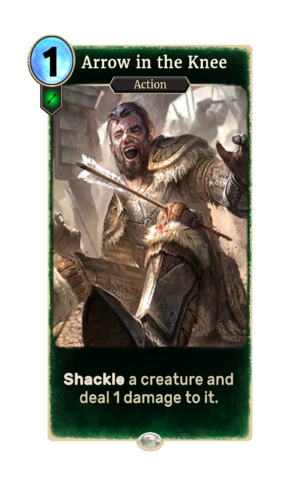 This card's name is a reference to a line of guard dialogue in Skyrim: "I used to be an adventurer like you. Then I took an arrow in the knee..."
The card was originally named "Arrow to the Knee", as seen in one of the first screenshots on Bethesda.net.